Quico says: Clearly, a large part of the opposition is still seriously concerned that the government will commit numerical fraud. 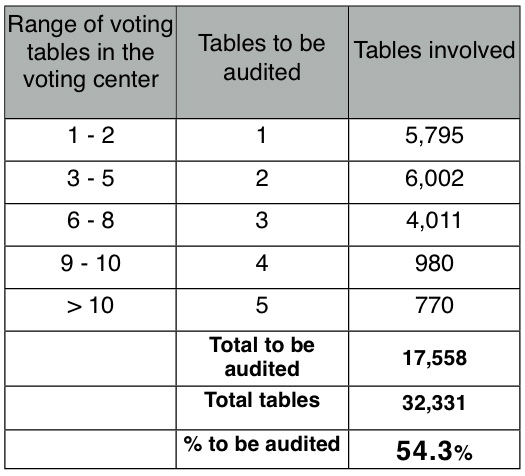 Unlike in past elections, though, the audit procedure proposed seems highly robust. Venezuela uses a controversial electronic touch-screen system. The contraption does, at least, generate a paper trail. And that paper trail will be intensively audited on the night of the election. The Elections Authorities have published an elaborate handbook for poll workers, detailing the procedure. 1) The chairs of the various voting tables shall meet at the place where table No. 1 operated, in the presence of the witnesses and of international and Venezuelan observers, if any are present, and they will proceed to select by draw the voting tables where the audit of the automated voting system will take place. 2)They shall write in identical pieces of paper the numbers of the voting tables that were used in that polling station, in ordinal sequence starting with the number 1. 3) They shall place the pieces of paper inside an envelope and shake it. The key thing to note here is that if the numbers in an envelope procedure is followed, any fraud committed will be very very evident. The opposition’s job now is to make sure these rules are followed. Rosales has been very clear about this. And really there’s no excuse if they still don’t have people for all the key places. Alarmingly, though, an opposition NGO is warning that the opposition has few or no witnesses at 732 voting centers in heavily chavista areas where 437,460 people vote, and also has a watchlist of about “high risk” polling stations where 1,833,033 people vote. We’re talking places like the Colegio Jose De Jesus Arocha, on the Redoma De Petare, and the Grupo Escolar Rafael Napoleon Baute at the Calle Real Del Barrio Jose Felix Rivas – both in Petare, Caracas’ biggest shantytown. In the Caracas area, there are many such polling stations in poorer areas like Catia, Santa Rosalia, El Valle, Antimano, 23 de Enero, Carallaca, Guarenas and Guatire. But they are all over the country.